The screenshot above shows what used to be displayed at the bottom of the overview page on the Hydrogen One website. 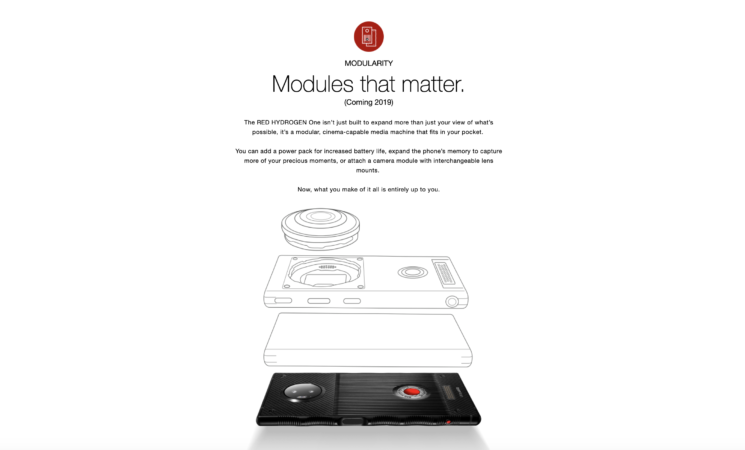 It speaks of “Modules that matter”, which were supposed to be coming this year. Although, apparently those modules don’t matter, after all, as they’ve been removed. Thankfilly, the Wayback Machine remembers everything (well, almost). Well, unless RED is planning some super secret launch and they’ve removed this in preparation, not anymore can’t add a power pack, memory, or camera module. I think it’s unlikely that they’d remove it just to officially re-announce them at a future data. At the release of the Hydrogen One, RED CEO Jim Jannard told The Verge, “If you were shooting an 8K Weapon on set as your A camera, this could certainly be your B camera. No question”. This seems to be a common sentiment amongst those who pre-ordered the Hydrogen One. They didn’t care about it as a phone. They bought it on the promise of the camera module. Jim also said at the time of the Hydrogen One release that “it’s true – the Hydrogen One does not succeed when judged as a traditional smartphone”. Well, that’s pretty much all this thing is now. If the camera module truly no longer exists and will now not be coming, then there are going to be a lot of angry Hydrogen One owners out there. And probably a flood of Hydrogen One phones showing up on eBay in the coming weeks as their owners switch to something that does succeed when judged as a smartphone. Pity, I thought this site is about DIY. Obviously just another site that takes random photo news from google and repacks them. Pity. It’s been my complaint for a while. Seems it’s just another Adsense website, so it doesn’t really matter. This is exactly why you don’t buy a smartphone for the camera, soon as the product is dropped you no longer get software updates and be lucky if it can be repaired.